Comprising everything you need to start shooting, the pearl white Canon IVY CLIQ+ Instant Camera Printer with ZINK Paper Kit from B&H bundles the pocketable instant camera printer with 50 sheets of 2 x 3" ZINK photo paper. 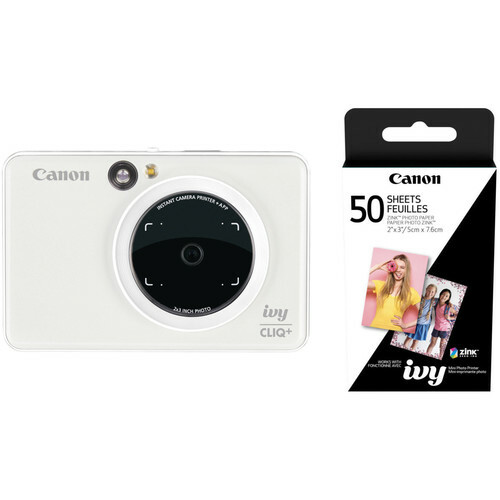 A pocketable camera and a sleek, portable printer in one, the pearl white Canon IVY CLIQ+ combines the fun of producing prints on the fly with the convenience of digital image capture. This compact instant camera printer utilizes ZINK technology to deliver 2 x 3" prints along with an 8MP image sensor and wide-angle lens for versatile shooting capabilities. Autofocus and auto-exposure lend true point-and-shoot functionality and the camera's design incorporates a flash for low-light situations as well as an 8 LED ring light for selfie illumination. To benefit selfie shooting, a large 2"-diameter shoot-through mirror is placed over the lens for perfectly aligning your self-portraits. The camera also incorporates an optical viewfinder, a microSD memory card slot, and has a built-in lithium-polymer battery. Box Dimensions (LxWxH) 5.6 x 4.2 x 1.7"